The Asia-Pacific Association of Agricultural Research Institutions (APAARI) was established in 1990 at the initiative of Food and Agriculture Organization of the United Nations (FAO) and most of the National Agricultural Research Systems (NARS) of the Asia-Pacific region and a voluntary, membership-based, apolitical and multi-stakeholder regional organization. It is bridging national, regional and global stakeholders to bring about collective change in agri-food systems of Asia and the Pacific. 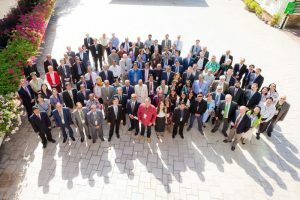 APAARI’s wide network of members and partners comprises of national agricultural research institutes (NARIs) and national agricultural research organizations (NAROs), CG centres, Association of International Research and Development Centers for Agriculture (AIRCA), universities, extension service providers, civil society organizations, (farmers’ organizations – FOs and non-governmental organizations – NGOs), international development organizations and the private sector. The close links and collaboration with these stakeholders are instrumental in strengthening agri-food research and innovation systems towards more sustainable development in Asia and the Pacific region. Following the call of the APAARI General Assembly to revisit the APAARI Vision 2025 in 2014 and to reprioritize its activities to meet the needs of a changing development context, APAARI developed its Vision 2030. The document outlines the Association’s vision for strengthened research and innovations for sustainable agricultural development. The APAARI Vision 2030 aligns to the United Nations (UN) Sustainable Development Goals (SDGs) and suggests a strategic direction for the future development of agri-food research and innovation systems in the region. The vision outlines the overall goal, mission and vision of APAARI. Vision: “Strengthened research and innovations for sustainable agricultural development in Asia and the Pacific”. Mission: Promoting, coordinating and strengthening agriculture and agri-food research and innovation systems through partnerships and collaboration, capacity development and advocacy for sustainable agricultural development in Asia and the Pacific. Goal: The Asia-Pacific region benefits from and values APAARI’s leadership and contribution to developing agriculture and agri-food research and innovation systems. Core Values: While the APAARI vision, mission and goals may change to keep pace with dynamic national and international contexts, APAARI’s core values have remained intact. They continue to inspire shareholders and stakeholders with APAARI as their trusted and dependable ally for sustainable agricultural development in the region. APAARI’s core values are as below. Visionary approach: Foreseeing the future and working in the frontier areas through collaboration and partnership to realize the full potential of scientific research and innovation for sustainable development, advancing ideas and innovations, and encouraging creativity and initiatives. Devoted to merit and excellence: Functioning as a capable and motivated organization providing an enabling environment for attaining excellence by investing available resources optimally to leverage the full potential of research and innovation for development. Learning and growing: Continually enhancing knowledge and skills to identify opportunities and capitalize on them for the growth and development of community, system, the nation and the weaker and smaller NARIs and NAROs. Inclusiveness with equity in participation: Strongly believing that only involving and including the contributions of all potential players and fully harnessing opportunities in partnerships and collaboration both nationally and internationally, with greater equity in participation and sharing of benefits, can meet the growing aspirations of all its stakeholders.